The story is set in the future and starts in one of the poor Districts of the post-apocalyptic world of Panem, where a powerful government called Capitol holds power. Panem rose out of the ashes of what was once known as North America. As punishment for a previous rebellion, one girl and one boy from each district is selected by the Capitol at random and is forced to participate in the Hunger Games, a televised event where the children called “tributes” must fight to their death in a dangerous outdoor arena. A jungle, a dessert, a marshland, no one really knows – until you become a tribute yourself. Only one survivor. Only one victor. The story revolves around Katniss Everdeen, a young lady from District 12 who volunteers to become a tribute in the 74th Hunger Games in place of her 12 year old sister, Primrose. She is joined by Peeta Mellark, a boy from her own district who once saved her life by giving her and her family some bread. Her adventure starts as they leave District 12 and she is thrown into a world of lies, deceit and a deadly form of government. She must use all her wits and the things she learned from home to ensure her and her family’s survival. Although the story is set in an unidentifiable future, I can’t help but think how Panem greatly resembles our current world. The division of the rich and the poor and how because of lack and poverty, sometimes the poor sees the rich with a combination of awe and contempt. Oh and how can I forget the televised entertainment we call reality shows? The only difference is, in the Hunger Games, they are real and the children’s death are for the Capitol’s entertainment. The Hunger Games is a powerful book that combines action, suspense, romance and politics in one seamless story that will leave you wanting for more. Every time you think you’ve figured out what’s happened or who’s behind it, you get surprised to find out that your assumptions are far from the truth. 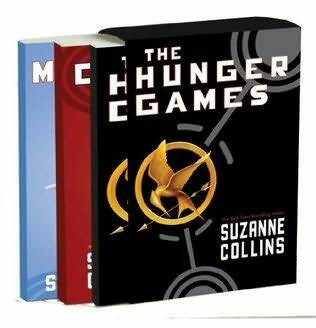 The trilogy starts with Book One, The Hunger Games. Then the plot thickens and continues with the second book, Catching Fire which takes you deeper in the world of Panem and ends in Book three, Mockingjay. What can I say, Suzanne Collins has won my heart. She had me at Page 1. I wasn’t able to put the books down whenever I started. So it comes as no surprise that I finished them 2 days after purchase. They are that good! And my friend was right. I’m glad I bought the trilogy, otherwise I would’ve died of anticipation. And now that I’m done reading, I still can’t help but think of it still. LOL! Obsession? Nah, just an aftershock I guess. I am actually ready for another book but this trilogy stays on my favorites list. ← Random Babbles – Blah Day.